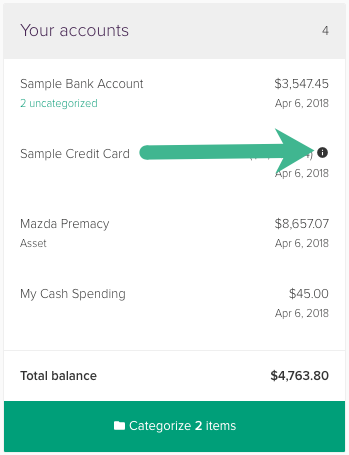 Beta testers are now able to access the Safe Balance feature, which adjusts selected balances to account for budgeted income and expenses that are planned but haven't happened yet. The new Safe Balance feature takes your current balance for an account, and applies all unspent and unearned budget portions to it, giving you the balance that is "safe-to-spend", once all outstanding spending and earning is taken into account. For example, assume you have $250 in your checking account. There is $80 remaining of a $120 Grocery budget. This will mean that your Safe Balance would be $250 - $80 remaining in your budget = $170 Safe Balance. Extending this example, if you also had a $40 credit planned that hadn't arrive yet (for example, an expected refund), then your safe balance would be $250 original balance - $80 Grocery budget + $40 credit = $210 safe balance. The Safe Balance feature is activated on a per-account basis. We'd recommend that it gets turned on for transactional accounts only (e.g. bank and credit card accounts), particularly those that contain your variable budgets. Categories are also able to be added or excluded from your Safe Balance calculations. For example, you may want to exclude all income from your safe balance, or remove your annual "Mechanical" budget because it is less relevant for your day-to-day expenditure. Firstly, head to the Beta Settings page under the Settings menu, and make sure that you're opted in to the beta program. This lets you see the Safe Balance options. Secondly, head to the "Other settings" page for each account you want to switch to Safe Balance mode, accessed from the "Manage Account" menu within the Account Summary. We recommend that you choose to turn on safe balance sparingly, for transactional accounts only. Once you save, your forecast will recalculate and you'll start to see the safe balance information pop-up next to your balances. More on this below. 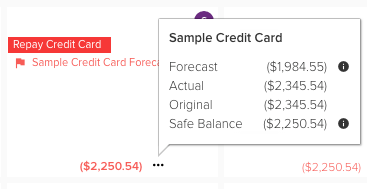 Next to each safe balance activated account, you'll now see an informational tooltip. This will contain your safe balance information, as well as your original account balance. This will also be available from within the Calendar, by clicking on the three dots adjacent to today's date. From this popup, you're able to open up the full view of your safe balance information. This is shown, along with explanations, below. The heavy black line represents your account balance as it's adjusted to become the Safe Balance. This is your original balance, which is the balance of your account as at today. These are your pending expenses, which is the total of your unspent current expense budgets within this account. This is your pending income, which is the total unearned income for this period within the account. This is the final Safe Balance for the account. This is the amount of money you'll have today, if all included budgeted expenditure and earning happened immediately. Each section can be clicked on, to see what budget the section relates to. All budgets that contribute less than 5% are clustered together. Also featured is the amount remaining in the budget, and a "hide" link, which removes the entire category from all Safe Balance calculations. This can be reactivated by editing the category. This is a beta feature, meaning you can expect there to be bugs and quirks. We'll be continuing to work on the feature and fixing up issues as we go. This is a complicated feature, and we'd love your feedback on what works and what doesn't. The Original balance shown will generally be your Actual account balance, for up-to-date live feed accounts. For out-of-date or manually updated accounts, the balance taken will be today's Forecast balance. It is crucial that the Safe Balance adjustments are made as at today, because the outstanding amounts are calculated based on spending up to and including today. It pays to carefully curate what accounts you want to be included in Safe Balance calculations. All accounts are de-activated by default, and need to be turned on manually to activate the feature. We recommend that only transactional accounts have Safe Balance activated. We found in testing that it is a good idea to exclude a number of categories from your safe balance categories, especially if you have long-running budgets set up (for example, large annual budgets for "Car Maintenance"). Large-amount, long-running budgets can significantly skew your Safe Balance numbers. Generally, we'd recommend that the categories you keep around for Safe Balance calculations are regularly occurring budgets and bills. All others should be removed using either the "hide" icon in the Safe Balance window, or from the Category edit page. We've a dedicated page for things that you may want to be aware of as a beta user of the Safe Balance feature. This contains more in depth information on things that we'd like to resolve before we exit beta. Find the quirks listed here.